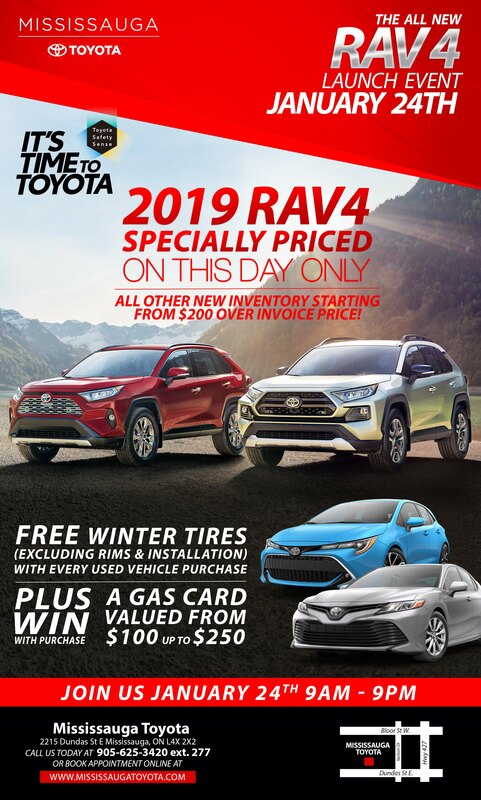 Come and see the all-new 2019 RAV4 at Mississauga Toyota! Call us at 1 (905) 625-3420 ext. 277 or fill out the form below and we will get back to you. The sale event is on January 24th, 2019 from 9am – 9pm. In order to qualify for the sale event offers, you must purchase a vehicle on January 24th, 2019. The 2018 Camry and 2018 Prius C will be the vehicles starting at $200.00 over dealer cost. In order to receive a free set of winter tires (excluding rims and installation), you must purchase a used vehicle on January 24th, 2019. Some exclusions apply. See in store for details.